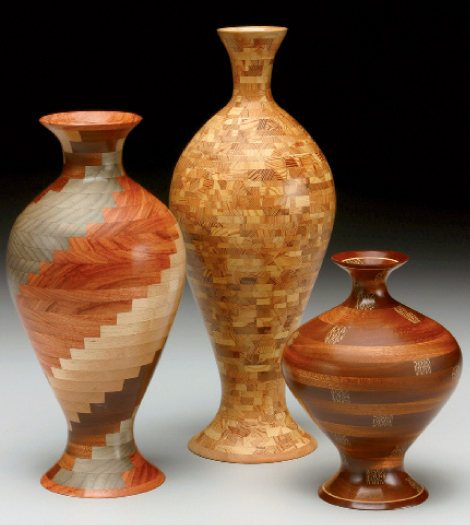 Stepped Spiral Vase (Left) bubinga, maple, mahogany, ebon-x, 5" x 12"
The Crown (center) antique heart pine, 5" x 15"
Anniversary Vase (right) mahogany, maple, dyed anigre, 5" x 7"
After learning the basics of woodworking from his father, Buzz Coren began making his multilayered bowls and vessels in 1993. The mesmerizing patterns in his work come from unexpected sources: “A flower’s shape, the geometry of a hubcap, an architectural element—it’s unlimited,” says Coren. While his intricate works often take 40 hours or more to complete, one heart pine vessel, The Crown, took two months to finish. Coren also creates wood earrings, pendants, and brooches under the name Featherwood.